Can you be still for a moment or two and imagine yourself an ideal combination of a classical thriller, thrilling detective, mysterious crime and the irresistible charm of the huge amounts of money? Now add to this mixture a few brilliant and tremendously charismatic actors, such as Ben Affleck or Justin Timberlake, who can do anything flawlessly after being in a boy’s band. Spice it up with an accurate and masterly worked-through scenario and bright and strikingly beautiful picture. What you will have as a result is a radiant movie, which will soon hit the screens – Runner-Runner, a new classic of thrill and a new tone of passion in the games of a chance. 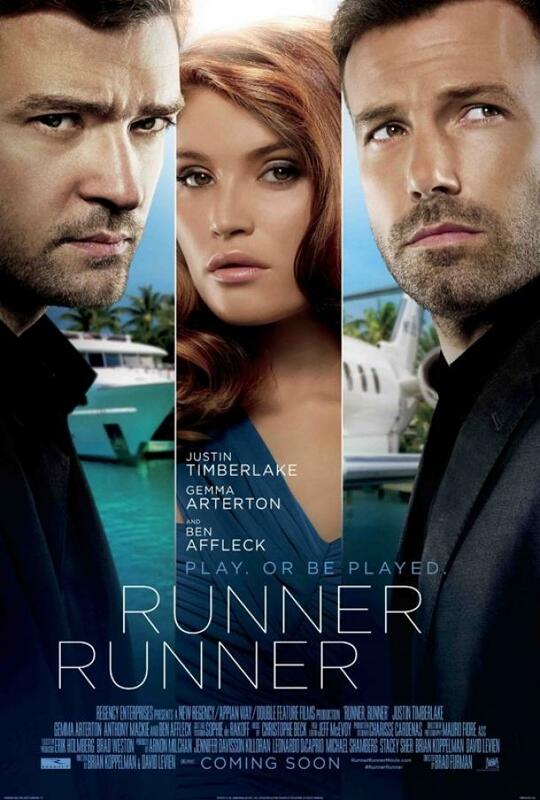 The story of Runner Runner might tell us once again of how dangerous gambling can turn out to be. Especially for those, who are unlucky enough to get lucky. The story of Runner-Runner might tell us of how touching a friendship can be and how fragile is love and trust. The story of Runner-Runner might tell us of the importance of being a law-abiding citizen and to never interfere in the areas we know nothing about. Basically, it can be a list of modest and ethical rules for children and beginning parents, who are not yet confident enough of their powers. Thankfully, the story of Runner-Runner is about insane risk, inexpressible drive, strength of desire, force of vanity and boundlessness power of money. The Runner-Runner starts with no surprises – from the most innocent basics and the most admirable goals. A boy named Richie was gifted, and he had all the intentions to nourish and develop his gift. He had a beautiful dream of going to the most prestigious math school, to graduate from it and then to become a scientist or an inventor. Long story short, he had a marvelous childhood dream, which was brutally spoiled by the lack of money. The school was way too expensive, finding a job turned out to be nearly impossible, And Richie suddenly realized, that he has nothing, but his gift. So there is now wonder that he found his avocation in online gambling. Soon enough, he was even more broke then he was when he started, but Richie was too determined to quit. So he decided to play big time. He flies off to Costa Rica to challenge the most influential man of this business, in a desperate hope to defeat him. But the businessman, being a rational and extremely enterprising person, had noticed Richie’s talent, and a sudden job offer transformed his life in a fraction of a second. But everything needs to be paid for, especially when it comes to such unstable business, as fortune. This is a story of Richie’s life, this is a story of a race of lifetime, this is a story about irrational, reckless gambling and a smile of the fickle fortune. This is a story of Runner-Runner, and you will be crazy with anticipation until it will be premiered in the cinema right beside your home.